In addition, our team of lawyers handles matters pertaining to administrative law, education law and class-action lawsuits. Our past clients have included high-profile coaches at the University of Oklahoma, student athletes and other notable figures. Founding attorneys Stanley M. Ward and Woodrow K. Glass bring more than 65 combined years of experience to our firm. Meticulous and disciplined, they believe in preparing every case as if it will go to trial, whether it does or not. This approach has proven to be beneficial to clients in all areas of practice. 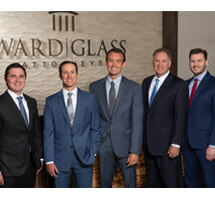 To learn more or to arrange a consultation, please contact Ward & Glass, L.L.P., today.